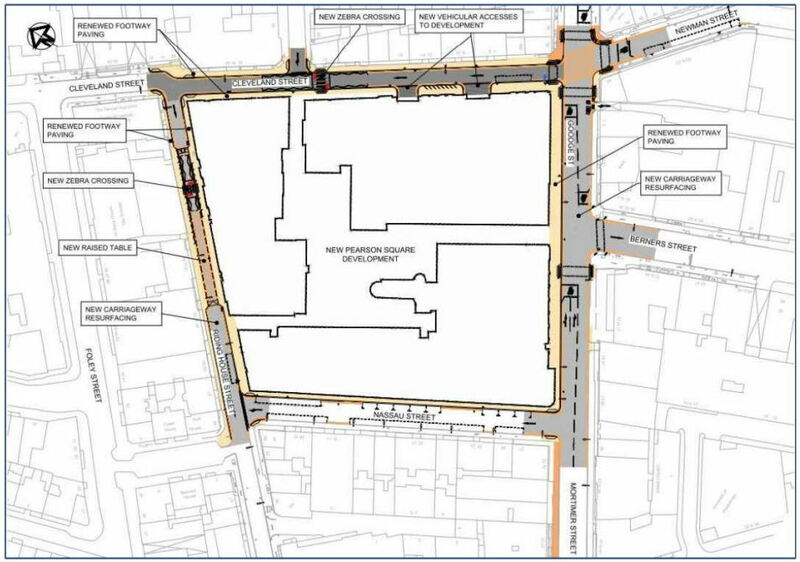 Several streets in the centre of Fitzrovia will be closed over three weekends in June to enable resurfacing and paving works in Mortimer Street. The work is being carried out as part of the final stages of the troublesome Fitzroy Place development on the former Middlesex Hospital site. Boys from the black stuff. 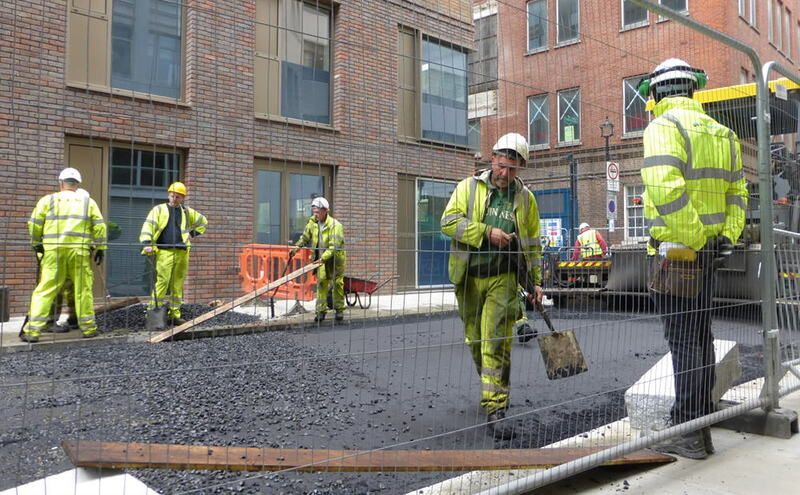 Fresh tarmac is laid along Cleveland Street. More roads around Fitzroy Place (aka Pearson Square) will be closed over three weekends in June. 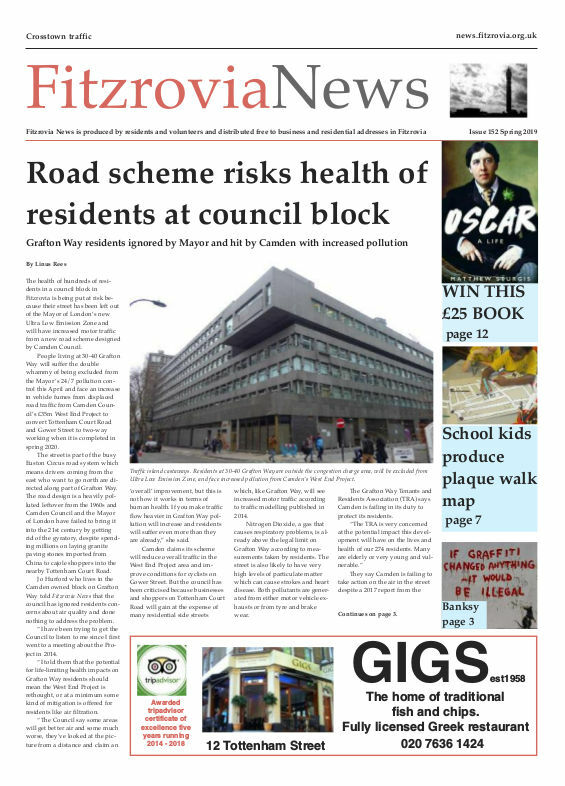 The work will be done by Volker Highways, acting on behalf of Sir Robert McAlpine Ltd and working in partnership with Westminster City Council, and who are currently undertaking improvement works to footpaths and roadways around Fitzroy Place (also known as Pearson Square). “The carriageway resurfacing works will be carried out over 3 consecutive weekends of 6th/7th, 13th/14th and 20th/21st June. “During the works there will be temporary road closures to Mortimer Street, Riding House Street, Cleveland Street, Berners Street, Berners Mews, Nassau Street, Newman Street and Goodge Street with diversion routes signposted,” said Edwards. Many roads will be closed over three weekends in June to allow for road and paving works as the final acts of Exemplar’s Fitzroy Place development are played out. Volker Highways says a traffic management plan will be displayed around the site and efforts will be made to minimise the effects on residents and businesses and maintain access wherever possible. The Fitzroy Place development, which includes a new publicly accessible space called Pearson Square, is due to be completed by the end of the summer, according to property developer Exemplar which is leading the project. The huge redevelopment of the former Middlesex Hospital site will have over-run by nearly a year after several problems dogged the later stages of the construction. Sir Robert McAlpine who won the contract to build the commercial and residential development blamed the troublesome contract for some of the firm’s financial losses. The largest single development in the neighbourhood has caused massive disruption and nuisance in the surrounding streets, and local residents and business people will be relieved when it is finally finished and they have seen the back of Exemplar.